Turn this option ON if your Facebook Product Catalog doesn’t include variations. The plugin will use the ID of the main item for variations and will send content_type as “product” instead of “product_group”. 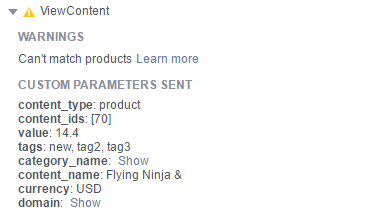 This particular parameter is used to match your store products with items from your Facebook Product Catalog. A Product Catalog is used for Dynamic Product Ads. There are several ways to create and keep updated a Product Catalog. We also have a dedicated plugin that can help you with it. It important that the content_ids logic is the same one as the ID field from the products inside the Product Catalog. If the products are not matched you will see a warning reported by Pixel Helper Chrome extension: “Can’t match products” or a similar text. If you’re not doing Dynamic Product Ads, you can ignore it.